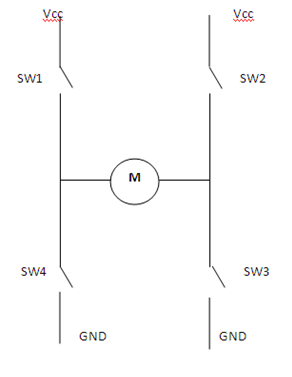 H Bridge configuration has many applications in controlling a motor. Generally, a motor can be either switched ON or OFF(uni directional rotation) based on the needs and the direction of rotation depends on the polarity. But, in the field of Robotics and Medical applications, a single motor must have the ability to rotate in two directions(clockwise and anti clockwise). For this purpose, an H bridge configuration is preferred. As the name indicates, the circuit will be in the shape of alphabet “H”. The motor is made to rotate in two directions by changing the polarity of the motor. 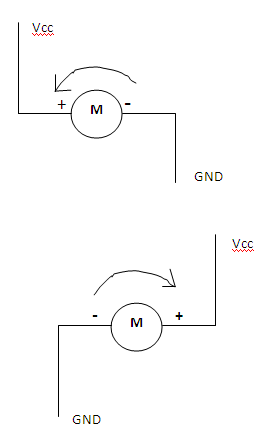 Here, when the gate is ON, the MOSFET is turned ON, hence forms a closed circuit and the motor receives the polarity based on the above explanations.